A college education can be a great option for mature adults with a clear idea of what they would like to accomplish in school and in their careers. 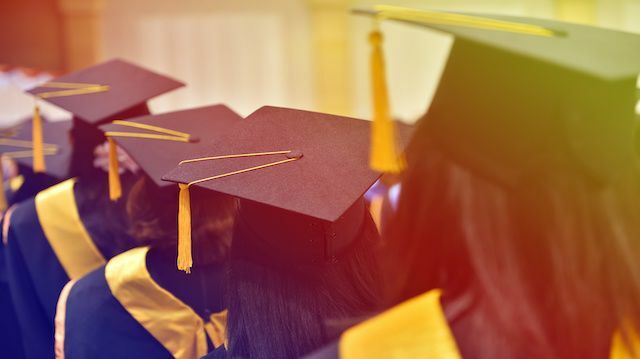 For young adults straight out of high school, however, there are a number of disadvantages, especially for those who don’t yet have a grip on their goals and aspirations. The No. 1 complaint of young people with a college degree is the crippling student loan debt they are burdened with upon graduation. The more prestigious the degree, the higher the debt. Money-conscious students might take two years at state school and then transfer to a more recognized private university. Their debt load is lower, but it’s not zero. Four years in school instead of the workforce is four year without pay. Four years of working up a corporate ladder, however, can lead to a relatively good salary. Four years of savings can add up to the down payment on a house or some other financial goal. Young people who spend four years working instead of attending college can find they have a financial nest egg instead of a pile of debt. College classes are largely theoretical. For all the talk of diversity, college students are a relatively homogenous group. Even study abroad programs are a shadow of the experience that independent international solo travel can offer. Despite their best efforts, college graduates leave their Alma mater with little more preparation for the real world than their high-school aged counterparts. Young people who choose to travel, work, start a business or master a craft enter the real world that much sooner and are often comparatively four years ahead of the curve. Some career fields require a college education. If you aspire to be a doctor, scientist, engineer or psychologist a college degree is necessary. There are a wide variety of other occupations, however, that do not require a degree. Any artistic endeavor, many technical careers and a whole slew of professions you may never have heard of can be tackled right out of high school. Lighting designers, sound engineers and plumbers can jump right into an apprenticeship. Writers, musicians and painters don’t need college to practice their craft. An aspiring entrepreneur may be better off taking their college fund to try their hand at a startup venture. Depending on the state, you may qualify for a position with the local police straight out of high school. Moreover, if you’ve chosen a career that doesn’t require a college degree any value that can be obtained from college will be from networking. You can’t make this assessment until you’re confident about your career path. Most 18-year-olds are understandably uncertain about their ultimate life and career goals, however. This is a recipe for an expensive college degree with little to no value. Backpacking around South America, spending a year at a Buddhist monastery or founding a non-profit are all useful, life-affirming experiences. Pounding a beer-bong full of questionable liquid while your peers provide a less than impressive countdown is not. College years are often touted as the most decadent fun a young person will ever have the opportunity to experience. As colleges have begun to cater to students as customers instead of wards, the culture on campus has come to reflect this lowered expectation. The vast majority of young students are prepared for, and deserve, much better than this particular form of extended adolescence. Better they are encouraged to go on that trip through abroad or any of a wide range of alternative options. Years ago a friend of mine confessed a dark secret. Discouraged by her never-ending post-graduate job hunt, she had sneakily taken an opportunity to peruse a stack of resumes sitting on her interviewer’s desk when left alone in the office. She confessed shock and dismay. They all looked just like hers: a good school, a good GPA, study abroad, leadership positions on campus and stellar volunteer experience. She had done everything right, but so had everyone else. Americans are often sold the narrative that getting good grades to go to a good college, excelling at that college and checking off a few preselected extras while in school will ensure them a good job. The truth is much more complicated than that. My friend eventually found a job, but having followed the same cookie-cutter path as all her peers was not the path to success she had been expected. There are a number of alternatives to college. More options — more formalized, society-sanctioned options — would be even better. Germany serves as a welcome example. The German apprenticeship program recognizes that college is not for everyone and the country has institutionalized working apprenticeships. Young people attend some classes, but also pair up with industry leaders to spend time working in the field. The result is a class of highly skilled workers specifically tailored for the needs of German industry. The apprentices have jobs, German industry has qualified workers and everyone wins. Will you, or your kids, go straight to college, or jump into life first? Erin is a freelance writer, photographer and filmmaker. She is passionate about moving beyond party politics to identify pragmatic solutions to social, economic and political problems. Her writing has appeared in the Washington Times, the American Spectator, Doublethink and Scuba Diver Magazine. She spends her free time scuba diving, snowboarding and ravenously reading popular nonfiction. Erin holds a master’s degree in International Political Economy from the London School of Economics. Hey Buddy!, I found this information for you: "6 Disadvantages Of Going To College". Here is the website link: https://www.thealternativedaily.com/disadvantages-of-going-to-college/. Thank you.